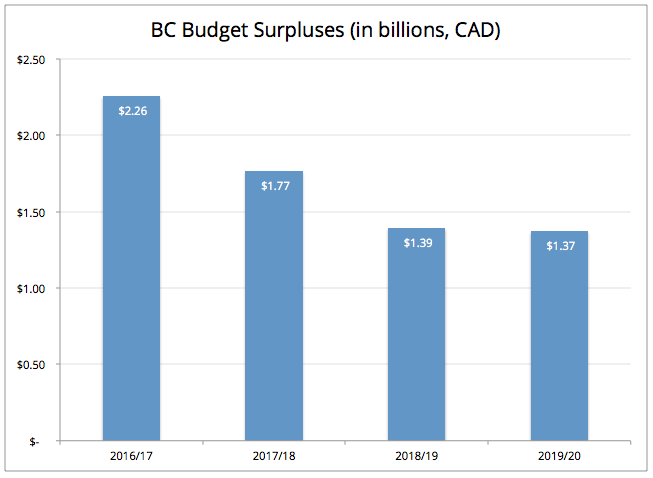 How big is BC’s budget surplus? Some recent media commentary has taken to flights of fantasy by assuming that large personal tax increases would be needed to fund the policies contained in the NDP and Greens’ Supply and Confidence Agreement. The assumption that major tax increases would be required ignores a key starting point: large surpluses are projected in this budget year and in future years. In this post we look more closely at BC’s fiscal situation and what the NDP and Greens have to work with for a new 2017 budget. The February 2017 budget projected a surplus of $2.3 billion for 2016/17. Officially this was stated as a $1.5 billion surplus, plus $800 million in contingencies and forecast allowance. Because the budget was tabled so close to the end of the fiscal year it is fair to say those latter amounts were not used. BC’s public accounts will reveal the final tally in the coming weeks. BC has substantial fiscal room to make new investments in programs and services. That’s all in the rearview mirror: the 2016/17 fiscal year ended March 31, and the year-end surplus does not carry forward to this year. For context, the whole BC budget is about $50 billion in operating expenditures (mostly wages and salaries for public sector employees) and another $8 billion in capital expenditures (such as infrastructure investments), while the BC economy is about $270 billion in GDP. The February budget was not passed before the May 9 provincial election, so for the current (2017/18) fiscal year, an interim “supply bill” was passed to keep government operations rolling. That bill covers anticipated expenditures for the first half of the fiscal year, meaning the Legislature must pass a new budget before the end of September. To estimate BC’s fiscal situation we start with projected revenues for each of 2017/18 to 2019/20 in the February budget. This maintains the 50% decrease in Medical Service Plan (MSP) premiums as of January 1, 2018, as well as other smaller tax measures in the budget which the NDP and Greens appear willing to keep. The February budget was also quite conservative in its revenue projections, assuming a 4.5% drop in personal income tax (PIT) revenues in 2017/18. We assume PIT revenues stay at same level as 2016/17 prior to tax increases, which is still conservative but more reasonably so. The NDP and Greens would introduce targeted tax increases on corporations and the richest 2% of income earners. Each of these increases would raise around $300 million over a full year. Due to the timing of a new budget we assume these increases apply only to half of the 2017/18 year, then the full amounts for the next two years. One item we do not consider above is future carbon tax increases, as we assume these will be revenue-neutral as per current legislation. The Supply and Confidence Agreement cites rebate cheques to low- to middle-income households to this end. The February budget tabled increases in expenditure, with higher amounts for health care, K-12 education and social services in particular. While a new budget could revisit any of these increases (except the court-mandated K-12 increases) it is likely that they would remain in a new NDP and Green budget. Finally, we roll in the customary budgetary “padding” of contingencies and forecast allowances to give a real sense of the available surplus. The results can be seen in the figure below. For the current fiscal year the underlying surplus is $1.8 billion, dropping to $1.4 billion in each of 2018/19 and 2019/20. The NDP and Greens thus have substantial fiscal room to make new investments in programs and services. Source: Author’s calculations based on BC Ministry of Finance, Budget and Fiscal Plan 2017/8–2019/20 (February 2017). Assuming a non-confidence vote is imminent, the NDP and Greens will shortly have an opportunity to table a budget that reflects the aspirations set out in the Supply and Confidence Agreement. That said, it is likely that some of the major pieces would need time to be properly developed and would be announced in the February 2018 budget or later. A great deal depends on the timing and roll-out of planned new expenditures, but figuring all of that out is the purpose of tabling a budget. One other area to keep an eye on is capital expenditures, which are not immediately tallied in the operating budget above (in accounting terms, they are expensed in the operating budget over the lifetime of the asset, which in most cases means over several decades). Some key promises in the Supply and Confidence Agreement are for capital expenditures: transportation, housing and other infrastructure investments all count in this category. The controversial Site C dam represents a potential capital expenditure of $7.8 billion over the coming three fiscal years, according to the February budget. These expenditures could be revisited pending the results of an NDP- and Green-initiated review of the project by the BC Utilities Commission. Also notable in the February budget’s capital plan is $2.4 billion for the Massey Bridge (tunnel replacement) project, but no funding for Phases 2 and 3 of Translink’s (Metro Vancouver Mayors’) ten-year transportation plan (mostly transit expansion, but including a new Pattullo Bridge). An NDP and Green budget could reverse these priorities, green-lighting the Mayors’ transportation plan and killing the Massey Bridge project. Finally, it is worth remembering that BC has an enviable fiscal position in terms of capacity to make investments to strengthen the provincial economy. As of fiscal year end, taxpayer-supported debt was equivalent to 16% of GDP, while provincial debt attributed to Crown corporations was another 9% of GDP. After a long period of austerity, it is imperative that BC move quickly to invest in infrastructure to underpin future economic prosperity.